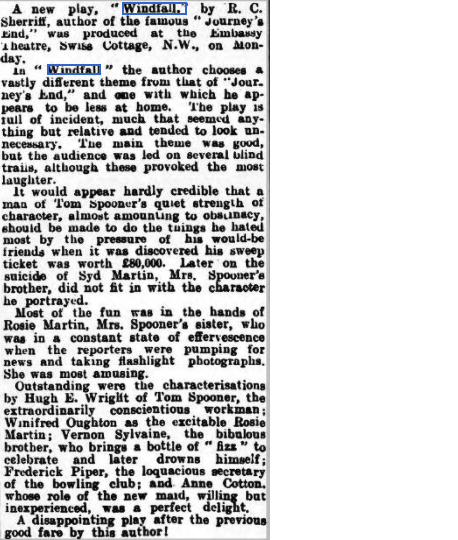 From The Stage - Thursday 01 March 1934. 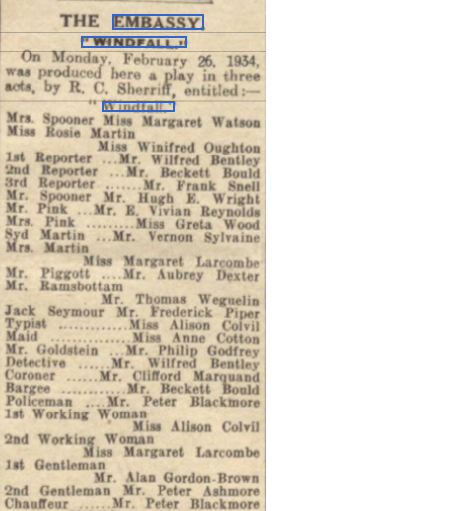 From The Hendon & Finchley Times - Friday 02 March 1934. From the Spectator of 2 March, 1934. 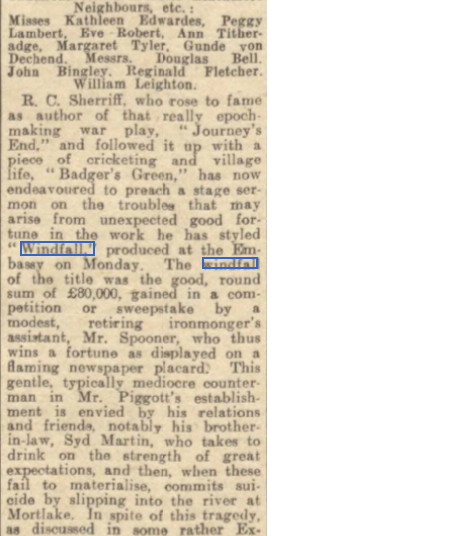 THE windfall was the sum of £80,000 which came to Mr. Spooner as the result of a ticket in a Derby sweepstake ; a ticket acquired in no transport of speculation, but as a consolation prize for the ignominy of defeat on the bowling- green. His good fortune means little to Mr. Spooner (he wishes to stay in his villa in Barnes which three more instalments will make his own, to play whist with the Pinks on Thursdays, to remain behind the counter at the ironmonger's shop where he is employed, to bicycle over to Kew with his wife on summer evenings, to retrieve that disastrous defeat at bowls, and the silver cup he lost with it), but it means much to his friends. It means much to Mr. Piggott, his employer, who hopes to use his money to convert a doubting country to belief in a patent cheese-grater ; to Mr. Ramsbottom, the carpenter, who tries to sell him some stained-glass, left over from a cathedral window, to replace a broken pane in the drawing-room ; to his sister-in-law, Rosie, whose soul reaches out towards pearls and the pelts of animals. 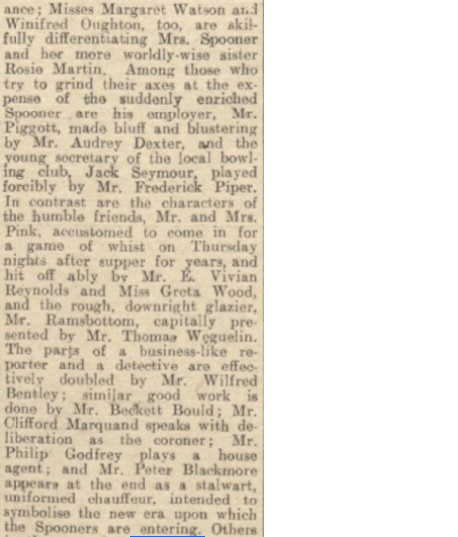 It means most of all to his brother-in-law, Syd Martin, who resigns from his employment on the assumption that Mr. Spooner will keep him for the rest of his life. Their ambitions and Mr. Spooner's resistance embody Mr. Sherriff's theme, and while he is introducing it the play has an air of substance. When he develops it, the play falls to pieces. Mr. Spooner refuses to finance his brother-in-law's inactivity, and Syd, in an ecstasy of indignation, throws himself into the river. The coroner's court, sitting on his death, is presented in a manner as innocent of illusion as of illumination. 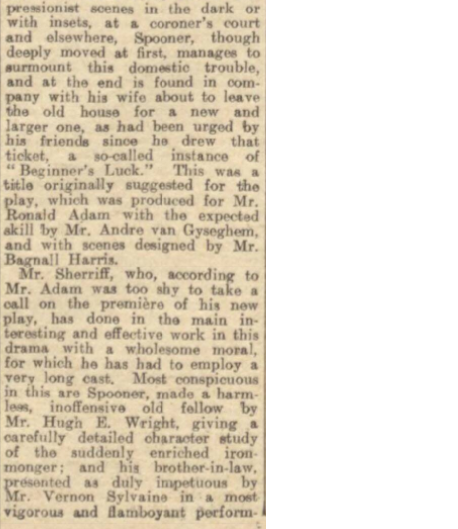 And Mr. Sherriff's attempt, in the last scene, to lend pathos to Mr. Spooner's migration from Barnes to Hampstead snot be considered as other than misguided. Mr. Hugh Wright plays Mr. Spooner with an air of heroism, but the obstinate, harassed little man is not enough drawn in the round to hold together the scattered episodes of which he is the protagonist. The smaller parts, in which there were good sketches by Mr. Frederick Piper, Mr. Aubrey Dexter, and Mr. Vernon Sylvaine, were never more than spasmodically amusing or conventionally pathetic. Greta Wood played Mrs Pink, in "Windfall" at the Embassy Theatre, London, in 1934.